We’re taking on an apprentice chef. If you (or anyone you know) is looking for a career in catering, and would like to learn in a small, dedicated kitchen working with fresh ingredients and creating high quality food, then please look at our apprentice chef advert. A Leicestershire pub is celebrating serving a century of local real ales this weekend, after only seven months open. The Geese and Fountain in Croxton Kerrial opened its doors last August, after the previous pub, The Peacock, had laid empty for nearly three years. Now, seven months later, they are about to serve their one hundredth locally brewed real ale. One of the things we are asked about most often by those booking rooms at the Geese and Fountain is WiFi. We’re therefore delighted to confirm that our free WiFi now extends throughout the pub, the beer garden and the B&B rooms. We know this will be popular with business travellers and those wanting to keep in touch while staying with us, especially with the rather poor mobile phone signal that Croxton Kerrial tends to receive. But we’re guessing it might prove quite popular in the summer with those just enjoying the beer garden too. Now you will be able to check in to facebook, tweet beer garden selfies or just log your summer refreshments directly into Untappd, all without leaving your favourite picnic bench. Join our discount club, save 10% on everything! What’s better than delicious fresh food, and great beers and wines? How about delicious fresh food and great beers and wines with 10% off everything? 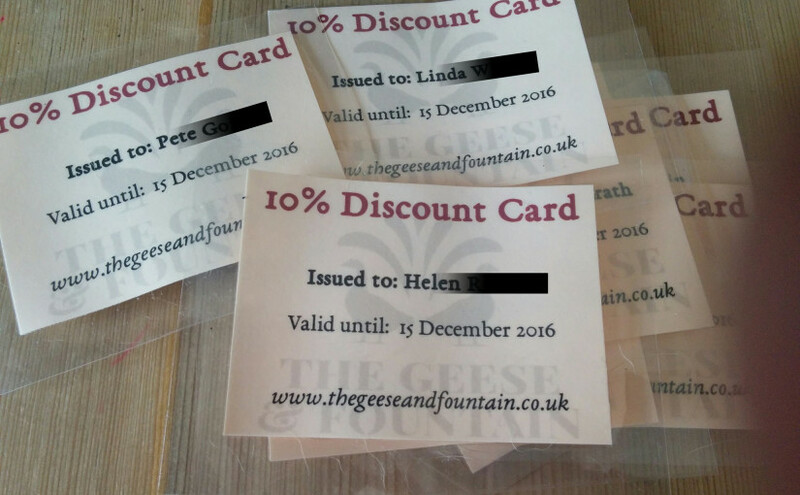 Yes, we’re launching a discount scheme – designed to enable our regular customers and locals to enjoy the pub for less, as their frequent custom is what keeps us going. We want to say thanks to those of you who come to the pub on a regular basis. Joining the discount club for £25 will get you a 10% discount on everything you buy in the pub for a whole year. Spend anything more than £5 a week (that’s about a pint and a half, or one large glass of wine), or have one meal each month and you’ll be saving money every time you come to the pub. Ask for a membership form next time you’re in, or download it here, and join the club. Posted on March 4, 2016 March 10, 2016 Leave a comment on Join our discount club, save 10% on everything!